Dharmesh talked about how Mind Candy had grown since the 2008 invention of Moshi Monsters from around 30 people with 1 agile team up to around 200 people with 8 agile teams. He described the give and take between discovery and execution within these teams. At the start of the process, discovery is so important to start generating new ideas and work, but as the business as usual time kicks in, the execution is more important. Mind Candy found that kids these days are getting the new technology and their parents are having the tech hand-me-downs. The kids are gaining priority in the technology space in the home. 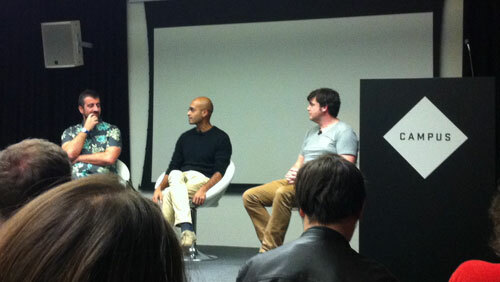 He also talked about an entrepreneurial company culture, something which is similarly encouraged at Karmarama. Will talked a lot about company culture, with a few examples of extreme culture. Valve software, famous for making a lot of computer games including Half-Life 2, have an extremely flat structure within the organisation. Projects are invented internally and then members of staff are hired to work on those projects. The good ones naturally succeed. Their employee handbook is fascinating. The old way of running a company is changing. Leadership from the top down is changing. Followership is replacing it and loyalty is from the top-down. Employees are a companies best assets. Let the employees choose their paths and they’re much happier for it. Barry took us through the five different employees most companies have. The different attitudes which people have to work and company culture. Money is a massive extrinsic motivator, but after a while it wears off and other more important factors come to the surface. Having a sense of purpose, some space and autonomy in your role, as well as a chance to master something is very important to people. The speakers talked about stuff which would have been approached completely differently 5 years ago. Mind Candy have an office which is almost like a child’s world in order to ignite creativity and inspire children and their parents who come in for group testing. Will at NixonMcInnes explained how their entire staff have an open relationship where everyone knows exactly what each other are paid, and at the end of each day employees rate their day using tennis balls in either happy or unhappy buckets. Barry explained about how their consultancy uses post-it notes and bright colours on mass in order to communicate a friendly brand to customers. All of these are just the start of new companies, new cultures and a more employee driven culture.